Using a single image as a template, computer software can find similar images in a large database of photos, as shown in these examples. Images courtesy of P. Milanfar. Peyman Milanfar, a professor of electrical engineering in the Baskin School of Engineering at UCSC, and graduate student Hae Jong Seo were able to overcome a major drawback of existing methods for computer recognition of objects in images--the need for an extensive "training" phase using a large number of examples. With a single photograph or video clip as a template, their software can sift through thousands of images or videos to pull out the ones that look like the template. "When it comes to recognizing things in the visual world, humans have some uncanny abilities which, at least until now, well exceed the limits of what could be done by computer," Milanfar said. "In particular, we have the capacity to recognize an object after having seen it only once." Existing technology can search for and distinguish individual objects in a database of images only after running through a time-consuming training phase. "If you're looking for images of bicycles, for instance, current algorithms have to be shown pictures of hundreds, if not thousands, of bicycles in order to be able to recognize a bicycle," Milanfar said. But the potential applications for Milanfar's work go well beyond browsing for cyclists on YouTube. By using videos of aggressive behavior as templates, the technology could help surveillance systems learn to recognize potentially dangerous situations. If a man reached for a weapon on camera and that action matched a template of such behavior, surveillance software could alert a busy security guard. A picture is a composite of thousands of pixels. Milanfar's software examines these pixels and their relation to one another. In other words, how similar is a central pixel to adjacent pixels in orientation, coloring, and shading? To find actions within videos, like a man riding a bicycle, Milanfar's software completes the same procedures but incorporates the manner in which those pixel relationships move over time. The software analyzes the map of pixel relationships and determines the salient geometric features of the object or action. These components remain perceptually constant within an object regardless of image quality. "The geometry of the bicycle is recognizable by the shape of the wheels and the way they are connected to the body, for example," Milanfar said. "We compute features from an image that are very stable. They are there even if we make the object bigger or smaller, change the background, or add noise." 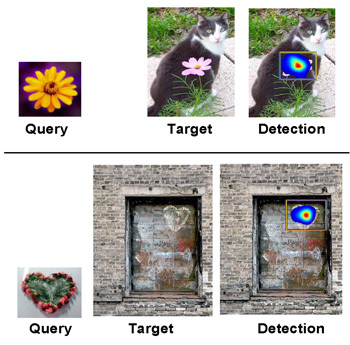 Search engines can use this algorithm to detect similar patterns of pixel relationships in a whole database of photos. The software calculates the statistical likelihood that a candidate image contains the queried object. If the template is a bicycle, the outcome consists of a series of photographs containing bicycles of all shapes and sizes, ranked in order of similarity. "This has been an area of research that has entertained people for many years, but the big successes have been few and far between," Milanfar said. "Our work is showing state-of-the-art performance with an accuracy as good as or better than any algorithm out there." Funding for this research was provided in part by the Air Force Office of Scientific Research.